Jude Law wore a gold masquerade mask as he partied at The Box in London on Wednesday night to celebrate the nightclub's third birthday. 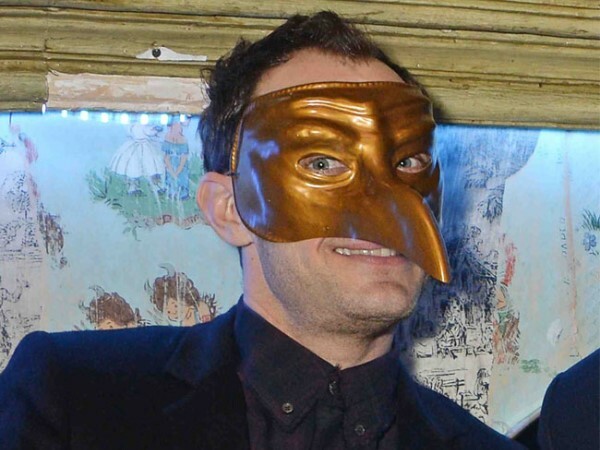 Jude Law hid behind a masquerade mask at The Box nightclub's birthday party in London on Wednesday night. The 41-year-old actor donned the gold mask for fun at the exclusive bash to celebrate the nightclub being open in the UK capital for three years. Jude had difficulty sipping champagne and Belvedere Vodka cocktails as the nose of the mask curved towards his mouth, but that didn't stop the 'Anna Karenina' star from enjoying himself. The big screen heartthrob spent the majority of the evening with Simon Hammerstein - the owner of The Box - only taking the occasional cigarette break, but at no point did he remove his mask. Other stars at the party included director Reg Traviss - the former boyfriend of the late Amy Winehouse - Made In Chelsea star Amber Atherton and We're The Millers actor Will Poulter. Will - who is up for the EE BAFTA Rising Star Award this Sunday - spent the night surrounded by beautiful women and at one point was salsa dancing with a stunning brunette. Guests were treated to performances from Ella Eyre, Clean Bandit and hip-hop DJ Grandmaster Flash.